There's a reason they call homeownership the American dream. We save and save just for the hope of one day having a place to really, truly call our own—a space to decorate how we want, to grow our family, and to create memories. But for all its upsides, homeownership comes with its fair share of headaches. Sure, you're probably aware that taking care of your yard and making those mortgage payments just comes with the territory. But there are a few other unexpected occurrences and oddities that can crop up. We don't want to deter you from the American dream; we just want to keep it an American reality. So brace for these bumps in the road when signing on the dotted line. There are plenty of jokes about how many imbeciles it takes to change a lightbulb. But the true punchline is this: Sometimes it really does take more than one person. We have crazy-high ceilings—one electrician told me he'd have to build a scaffolding and get a permit from the city to change a bulb. Thankfully, we found someone with a really tall ladder to do it (no permit required). Pro tip: Get long-lasting LED bulbs. 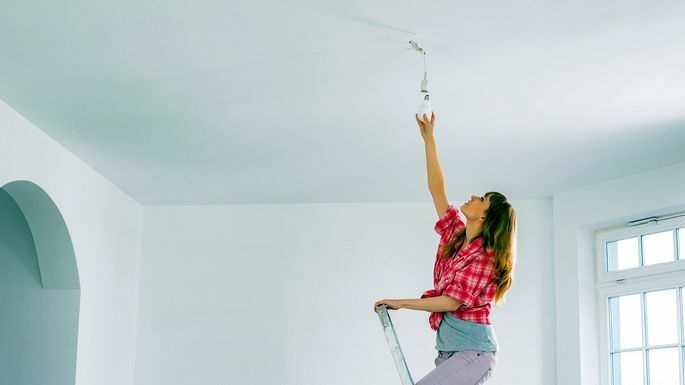 Even if lightbulbs aren't the biggest challenge in your home, rest assured you’ll be saddled with some simple-sounding piddly annoyance that will cause you to bang your head against the nearest wall. Be careful not to bang too hard—you own that wall now. Pinterest makes it look so easy to create beautiful works of art and decor on the cheap. But when you actually try that textured painting/fireplace remodeling job/cabinetry update, you end up with a huge Pinterest #FAIL. I once tried to transform a huge bulletin board into a fun, fancy creation for my daughter's bedroom wall; but I learned the hard way that washi tape is not as easy to use as it looks. The sticky, lopsided mess looked nothing like the Pinterest picture. And the aftereffect is that my house remains largely undecorated because, let's be honest, hiring people to do this stuff for you is expensive. The great thing about owning a home is that you never have to worry about rent increases or your landlord making you move out when the lease is up. The not-so-great thing about owning a home? Your lease is never up. Renting provides flexibility. Move for your dream job in Morocco? Why not? The perfect house in your now-trendy hometown is finally on the market? Go ahead! Even if you're in the middle of your lease, it usually won't bankrupt you to break it. Sure, as a homeowner, you can make these kinds of moves on a whim—but it could cost you big-time. Don't count on being able to sell your home in a hurry. At the very least, don't expect to sell without being prepared to take a loss. In case it hasn't hit you yet: When trouble arises, you're on the hook, so now's the time for a swift education on potential home maintenance problems. I can't tell you how many vacations we've returned from, totally relaxed, only to realize the air conditioner had quit working, the water upstairs was leaking through the ceiling, or somehow the dishwasher had pooped out even though no one was using it. Unfathomably these things always seem to happen just in time to kill our vacation buzz; it makes me nostalgic for my carefree days as a renter, when someone else would sort things out and pick up the bill. From replacing air filters to stocking up on weed killer, drain cleaner, and specialty lightbulbs, it sometimes feels like my husband and I spend more time in our local Home Depot than we do in our home. Before we became homeowners, we had no idea just how many things need replacing just to keep everything working. Case in point: Air filters. Do you have any idea how often you have to replace those things to keep your heater and air conditioner running well? It varies, but most manufacturers say every 30 to 60 days. That's a lot of air filters. Speaking of things you need to keep your house running, you need money—lots of it. When you're renting, your only bills are typically cable, electricity, telephone/internet, and water. When you own a home, the bills just keep coming. Currently, in addition to the aforementioned bills, we pay for utilities (water, trash, sewer, and other city services), lawn service, lawn pest service (which somehow isn't part of regular lawn service), an inside pest service, propane, pool service (a must when you live in Florida), homeowners association fees, and a few others I'm forgetting. The point is this: When you're calculating what you can afford, there is much more to consider than just the cost of the mortgage. Before you buy, make a realistic budget that leaves a cushion for emergencies. That way homeownership can continue being the dream—instead of inducing nightmares.